What would your dream wedding be? Your dream wedding in Lake Garda, Italy……one of the most romantic wedding destinations in the world. Your wedding service in a magnificent 16th century palace the ‘Palazzo della Magnifica Patria‘ that stands just twenty meters from the lake shore in the historic center of the jewel of Lake Garda, Salo. Arrive at your wedding in a classy retro boat, a classic Italian car or by strolling from your nearby hotel along the most beautiful ‘lungolago on Lake Garda’. Wait under the elegant ‘loggia’ until you are ready to step through the impressive wooden doors and walk up the dramatic winding marble staircase to the Sala Consiliera, where your family , friends and future husband await. As you enter the impressive room you are greeted by stunning frescoes, exquisite art and the sound of your special tune which is being played on a grand piano. You step up on to the raised stage where your fiancé awaits and the wedding ceremony is performed to a backdrop of the glistening lake through the windows. The ceremony complete, descend the staircase hand in hand with your new husband, out through the grand wooden door and into the piazza where you are showered with confetti. You board a boat with all of your guests, maybe after first taking a ‘brindisi’ (a champagne toast) in one of the lakeside bars which has been reserved especially for you. 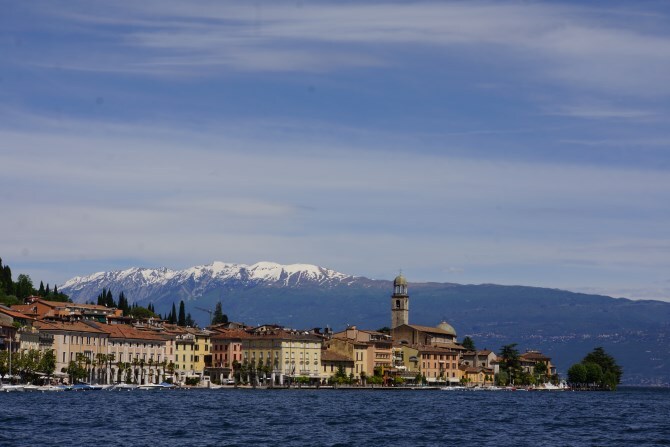 A short tour on the boat, perhaps around the stunning Isola Del Garda, before arriving by boat at your lake side reception venue. finesse, a theme that continues through the gardens to the lakeside terrace and into the restaurant. It is in the gardens where you are served your ‘aperitivo’ and the ‘antipasti’ and you experience a performance of true culinary theatre which drives your senses into a frenzy. A mouth-watering selection of finest Italian produce and cuisine, prepared by Michelin starred chef Ricardo Caminini, are served at different locations in the garden by perfectly attired staff. You have had plenty of time to absorb the truly magical atmosphere and the opportunity to mingle with your guests before it is time to sit down at your wedding table on the magical lakeside terrace. Here you are served two more sumptuous courses, the sound of the lake gently lapping against the stone terrace wall. You return with your guests to the garden where you are treated to another culinary extravaganza where you are served exotic deserts in a similar fashion to the antipasti. Taking centre stage will be your traditional Italian wedding cake ‘Mille Foglia con Crema Chantilly’……how many of your friends will have had their wedding cake prepared by a Michelin starred chef? As the light fades and you are completely intoxicated by the wonderment of your wedding day, unique Lake Garda atmosphere (and perhaps a few glasses of the superb local wine that was served with your dinner), the band plays your special tune and you are taken by your husband for your first dance of many in your new life…..husband and wife. All of the magical and intimate moments of your special day are captured perfectly by Lake Garda’s finest wedding photographer, Sarah Ferrara, ensuring your memories will last for ever. If you’re thinking that a wedding like this is out of your budget think again….you can have a wedding like this if you have a budget around £12,000**. If this sounds like your dream wedding then go here and fill out an enquiry form today. The Garda Weddings web page that all the links send you to isn’t working. You can contact us here….how can we help.